A Very Rare Large size Pra Put Pim Chiang Saen Yai Kru Wat Tap Khaw ancient amulet, from the first Era Batch (Sukhothai), 'Nuea Graeng' (stone hard), with rugged and defined features, and the classic aspects of a true Pra Niyom Master Class amulet of the Pra Kru Hiding Place Amulet Category. The Pra Pim Chiang Saen was found only in extremely small numbers. This exhibit is a highly preferred Pim of the first era pantheon, and is quite large in size, measuring 6 x 4.5 Cm. The Muan Sarn Sacred Clay of this Pristine and highly attractive exhibit is extremely time-hardened, and has a stone-like appearance, of an ancient amulet that is full of character. The amulet is considered an Ongk Kroo Reference Study Amulet. 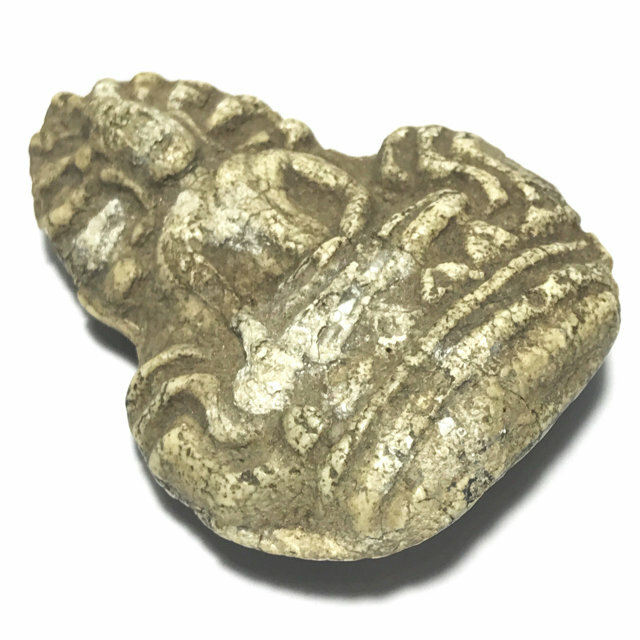 This Pim Chiang Saen however is dated from long before Somdej Pra Puttajarn (Dto) Prohmrangsri, and from the first of the three eras of amulets found within the Kru hiding place. Because of the much younger age and appearance of the third era batch which was buried at a later time than the first two batches, and the replicas found in the batch, confusion arose, causing the whole Kru Wat Tap Khaw find to come under scrutiny and suspicion about their true age, and for quite a long time the amulets were overlooked, due to the fact that few people realised that the amulets of the two other eras were indeed much more ancient.